Definition: Variable is a place-holder where you can store some value in the computer’s memory. It will have a name which can be used to access or modify its value. In Vbscript, variable are of datatype ‘Variant’. First, we will discuss about the Scalar.It has a naming convention as given below. MUST always begin with an alpha character. MUST NOT be the name of a predefined keyword used in VBScript. Incorrect: 123val, val.123,val. , val.val, Date etc. Is it possible to override the predefined variable or incorrect variables? Yes, by placing the variable name into a brackets. Dim : It is used to allocate storage space for one or more variables i.e. declaring variables. Dim: If variable defined at script level then variable will be available in all procedures of the script and if defined in procedure, then it will be available in that procedure only. It is not mandatory to use Dim statement while declaring variables. If omit, the variable will be allocated memory in the computer and value can be assigned to it. Array is a kind of container which can contain multiple values. Values can be of any datatype like integer,string etc. The values in array is stored on the integer index basic like 0,1,2,3.. etc. The first value will be 0 index and second at 1 and so on..
We need to define the sizeof the array at the time of declaration. Please look at the example below. In this example, size of the array is 3. Values can be stored at indexes 0,1,2 only. Environment Variables: These variable are an in-built feature of UFT. These are nothing but the Global variables. If once defined in any script, these can be accessed across all the script during execution. There are 2 types of environment variables. It can be seen or defined at the location ‘File –> Settings –>Environment(Tab)’. Built-In environment variable are predefined variables which provide the information about Actions like Action name,Action iteration and OS version,Local host name,Testname etc. User Defined environment variables are created by users. They can be of 2 types as given below. Internal Environment variables : These variables can be given a name and value and then can be accessed in the program with the below syntax. In the below screen , we can see a + sign. Click on that and add name & value. You can observe the type as ‘Internal’ highlighted. Export Button: This button is used to save the Internal environment variables at any desired path , if required. It will be an XML file. Load variable and values from external file: It is also possible to upload an xml file containing the Environment variables. It will be having the same format of file which you get after exporting. 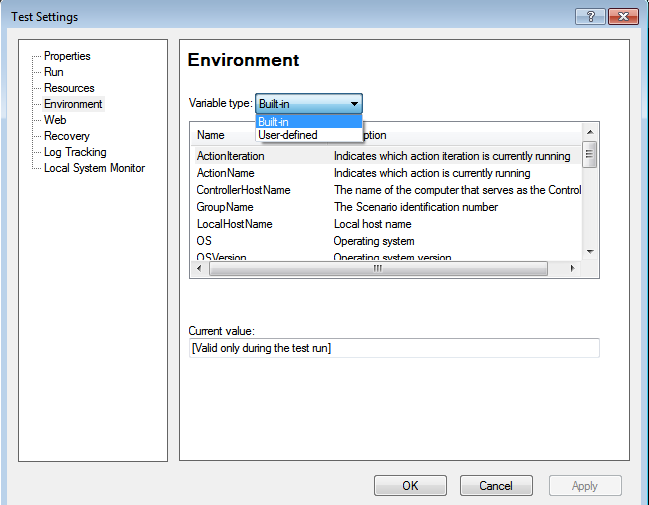 Can we define environment variable at run time? We can upload the environment variable file at run time as well(as given below).